View the current installation, configuration, and connection status of DataStax Agents. From the Nodes section of OpsCenter, select different views (Ring or List) of the nodes that comprise a DataStax Enterprise cluster and perform node management operations. View the status of agents, install and upgrade agents, and troubleshoot any agent issues in the Agents view. The OpsCenter workspace overview introduces the major areas of functionality available from the menus in the OpsCenter UI. 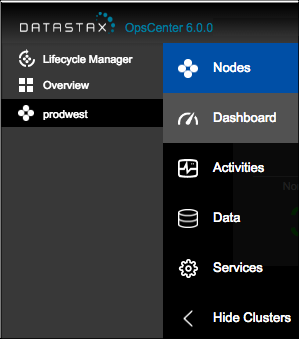 New Cluster - Create a new cluster in Lifecycle Manager or manage an existing DataStax Enterprise cluster within OpsCenter. Alerts - Configure alert thresholds for a number of cluster-wide, table, and operating system metrics. Cluster Connections - Modify cluster settings or disconnect the cluster from OpsCenter. Users & Roles - Manage users with role-based authentication. Help Center - opens the current DSE OpsCenter documentation. Feedback opens a form for sending feedback to the OpsCenter team. Report generates an HTML report with information on the managed clusters. Diagnostics downloads a tarball that contains diagnostic information about the nodes in a cluster. Username - When OpsCenter authentication is enabled, the username for the currently logged in user is displayed. Click your username to change your password or to log out of OpsCenter. The left navigation pane provides a link to Lifecycle Manager, the OpsCenter Overview, and lists the clusters monitored in the OpsCenter instance. The cluster navigation menu provides access to the functional areas within the OpsCenter UI; such as Nodes, Activities, Data, and Services. Lifecycle Manager - Launches Lifecycle Manager for managing installation and configuration for DataStax Enterprise clusters. Note: Accessing Lifeycle Manager requires the Admin role if OpsCenter authentication is enabled. If the Lifecycle Manager menu is gray and unavailable, contact your OpsCenter admin. Overview - Provides a high-level overview of the clusters and activity within an OpsCenter instance. Displays any active alerts and a summary box for each cluster managed by OpsCenter. The Cluster Actions menu is not available from the Overview because it is a summary of all clusters in an OpsCenter instance. Nodes - View your cluster from different perspectives (Ring or List View) and perform certain maintenance operations on cluster nodes. View the status of agents, troubleshoot, and install agents from the Agents tab. Dashboard - View information about the clusters managed by OpsCenter and monitor a number of performance metrics. Real-time and historical performance metrics are available at different granularities: cluster-wide, per node, or per table. Organize your dashboards using presets, which you can also export and import into other OpsCenter instances on other machines. Update notifications for upgrades to DataStax Enterprise are also displayed in the Dashboard. Activities - Displays all running tasks in the cluster. When tasks are running, the Activities icon displays a badge with the number of currently running tasks. View the most recent OpsCenter log events, such as OpsCenter startup and shutdown, in the Event Log. Data - Manage keyspaces and tables (column families) within those keyspaces. Services - Enable DataStax Enterprise Management Services; including the Backup Service, NodeSync Service, Repair Service, Capacity Service, Best Practice Service, and Performance Service. Hide/Show Clusters - Toggle to hide or show the list of clusters in the left navigation pane.